Flutterbye Aromatics was founded by Simone Karsman as a result of a life long passion. It is located in Savannah GA. Both the water and the history of Savannah create a relaxing atmosphere and provide inspiration to formulate unique blends, both for therapeutic aromatherapy and skin care. Simone has worked with herbs and essential oils for over twenty years. She studied aromatherapy with renowned Sylla Shepherd Hanger at the Atlantic Institute of Aromatherapy, and with Medical Herbalist Martin Watt. Martin Watt is the premier authority on skin safety issues in aromatherapy today. Growing up, Simone spent her summers at her grandparents' Tennessee farm where she helped in the gardens and fruit orchards. She attributes her passion for natural products, organic herbs, gardening, and 'fresh is best' philosophy to those experiences. Flutterbye Aromatics caters to the informed consumer who is knowledgeable about maintaining health and beauty through the power that nature has given us, is aware of the hype in advertising, and knows what's good, not only for healthy skin but for mental and spiritual health. Please do not assume that our low prices indicate low quality ingredients. If you are used to paying 3 or 4 times as much for your skin care, you'll be delighted to know that here it is not necessary to pay for advertising and packaging. Instead, you're spending your money on products made with pure, natural ingredients such as essential oils, herbs, flowers, clays, seeds, organic oils, and pure hydrosols in basic packaging without unnecessary outer boxes. To conserve your shipping costs, we package most products (except essential oils) in appropriate plastic containers. However, if you prefer glass, please let us know. Flutterbye has never advertised, auctioned, or sold products on Yahoo, eBay, or other online auctions. We are proud to say that our business has grown solely by word of mouth from satisfied customers. We now have customers in ten foreign countries and in almost every US state. Our cherished, satisfied customers have made this possible, and we appreciate every one of them! Our customers are also conscious of giving back to nature by recycling. At Flutterbye Aromatics we cycle and recycle our packaging products, saving you money while we save nature's resources. Simone has been making and using her natural products since her children were small. Chase (left) and Morgan (right) are grown now, but they still love and use aromatherapy and herbs. 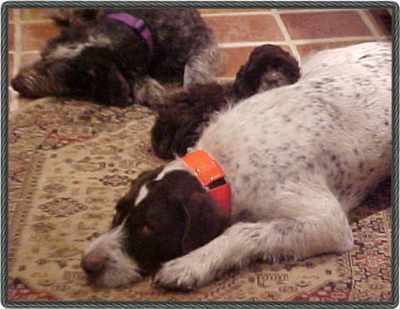 Simone lives in beautiful Savannah, GA with her German Wirehaired Pointers and Parti Cockers. Thank you so much for your interest in Flutterbye Aromatics. Please let us know if we can be of help in any way.